Explains how to deploy many Remote Access Services to remote computers automatically. This will open the Remote Access Profiles pane. From here you can click 'New App' to configure a new installer application. The configuration pane for each profile is almost identical to the standard Remote Access configuration app. In here you can add your server URL using whatever protocol you wish (please note you should only ever add your SimpleHelp server once, using one protocol). You can configure the machine group, security and proxy settings ready for deployment. Install Menu Shortcuts determines whether menu shortcuts should be installed for this access service when it is deployed. Silently Install determines whether the Remote Access installer will prompt the user and show any progress dialogs when installing. If you plan on using Mass Deploy then you should ensure this box is ticked. Once you have configured your Remote Access installer to your satisfaction you can click Copy Link to place a link to the app download page on your clipboard, or Download to open a browser to the relevant download page for testing. The app download page will appear exactly as the standard Remote Access download page but any apps downloaded from it will automatically install with the configured properties. The page link or a downloaded installer can be passed out to clients to have their Remote Access services automatically install with the correct machine group, proxy configuration or other configured elements. 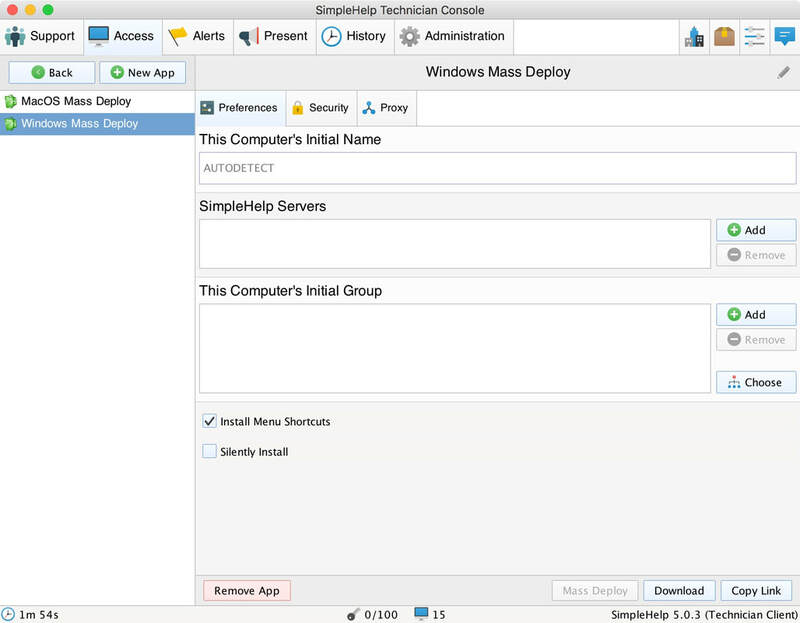 If you wish to automatically deploy the configured Remote Access profile onto remote machines you can click the Mass Deploy button to be taken to the Mass Deploy pane. 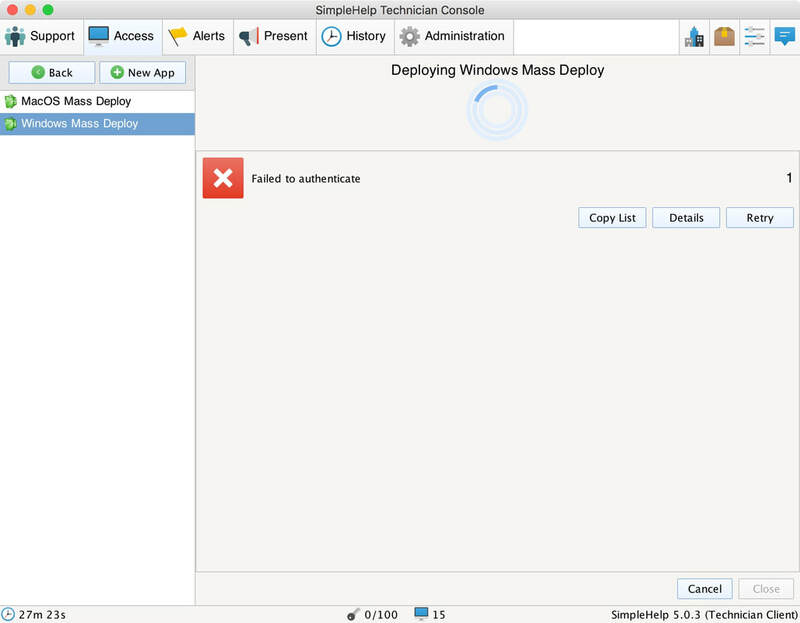 The Mass Deploy button will be disabled if the Silently Install checkbox is not ticked. 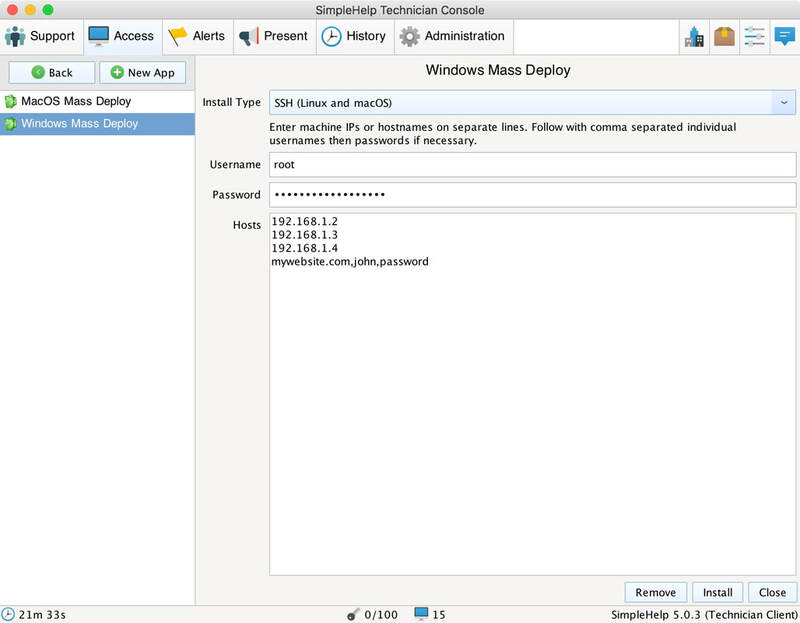 Mass Deploy allows two kinds of remote installation - SSH for Linux and Mac machines and WMI for Windows. If you are deploying on Linux or macOS the credentials you supply should be root or a user capable of sudoing with their usual password. If you are deploying via WMI then the Technician app must be running on a Windows machine and the credentials you supply must have appropriate permissions to both map admin shares of the remote machine and make WMI calls (wmic.exe) to the remote machine successfully. Username is the default username that the deployment will use for accessing the remote machines if a specific one is not given. Password is the password that will be used in combination with the above default username. Hosts is a list of IP addresses or hostnames that represent the machines to deploy the configured Remote Access Service to. Individual lines can also have a specific username and password appended with commas to override the default username and password. Once your list of hosts is configured you can click Install to install the Remote Access service on the remote machines or Remove to remove it. The following pane will show you progress and aggregate both successes and failures. Should one or more hosts actions fail for any reason you can click Details to get more information on exactly what went wrong, Retry to attempt the installation again if you believe it was a temporary issue or you have resolved it, or Copy List to copy the list of affected hosts to use in a future mass deployment when you have resolved the issue.